Ok so for christmas this year mrs taeles satisfied the one and only thing I missed about the note7 I had briefly back in august. Gaming. This tablet is almost 2yrs old now yet is still continually at or near the top of most review sites for gaming tablets. Why? Well a, its the only android tablet in the world designed first and foremost with gaming in mind and b, its built by nvidia themselves, makers of roughly 50% of the worlds graphics cards for pc, consoles and so on and on. Amazing this tops gaming reviews even given its age and 200 dollar price point.. I've been playing with mine for about a week now and... lets see. For a microsd card that was solved suprisingly easily. When I got my note7 last year samsung gave me a 256gig samsung evo+ 80ms speed microsd for free and when the recall happened they told me to go ahead and keep it. The shield official sites only discuss support for up to 64gig cards but I took a shot and tossed this 256gig in... and it works perfectly. Whats more? marshmallow update for android added a nifty 'merge' type feature for microsd cards. It locks the card to the device its plugged in making it useless to remove. It locks the device to the microsd card making the device actually perform poorly if the card is removed. Sounds restrictive, no? Yes but the benefit is outstanding. When you use this 'merge' feature the device regards the sd card as internal storage. Meaning you can install absolutely anything on to it from googles store. Most games as a default don't let you put their files on external storage, likely for cheating prevention/theft countermeasures. This is the compromise. Fun Story : Two years ago I bought an ipega attachable controller for my ipad only to discover that 95% of controller games don't work with the controller because most games only support apple's mifi format and this controller is bluetooth. I tossed the controller in my junk drawer and its chilled out there ever since until last night when I gave it a whirl on my shield. Results? Works flawlessly! Win! Another thing I like about this shield. Google Play. Thats Googles version of Apples now defunct Gamecenter. Full Achievements. Full Cloud. You can even look up app store games from inside Play and see if they actually have achievements and leaderboards. No more of the old apple "supports gamecenter" in a games description to find out it supported the cloud with no achievements after purchase. The achievement system is even linked to a leveling up rpg mechanic. Every achievement has exp value attached to it. Level up. Observation : Any paid for premium app if played for less than 2hrs has a nifty 'request refund' button on it in the google app store. Observation : Emulators! I have a NES, sNES, Gameboy and PSP emulator installed, legitimately. The emulators are on the freakin app store! Downloading hundreds of old games right now that I previously owned but cant play anymore due to lost games or game devices etc. Really... really impressed so far... I was honestly looking at the Pixel C tablet and didnt mind the price tag on it (600usd) but walked away when I discovered Google's official devices have no microsd slots. No microsd... and you limit it to 64gig? Well thats just stupid. Meant to put this in the other games board. Doh! The more I fiddle with this tablet and the droid OS, the more I seriously want to grab the final call maker at apple who killed gamecenter and just strangle them for a good while. I've come to accept that in its defunct state the games that have it already implemented will keep it but more and more games simply won't use it for anything beyond cloud save. No more achievements, etc. I've observed this happening more and more every month since iOS10. But I didn't realize just how fond I was of gamecenter and how much I miss it until I spent a week with googles "Google Play".
. A Leveling system that you earn experience by earning achievements in your games, check. Reminds me of the Playstation achievement system.
. Oh hey look I can actually look up games I'm considering buying... in the google play app and in there I can see if they have achievements and the like. I really want to strangle apple's leadership. They royally screwed the pooch on this. any time a game comes out on ios ive begun checking google play on my k1 to see if it is on the droid and has google play achievements. if it does, i get it for my droid now. It is good to hear that the K1 is working out very well for you. You might also want to give the DirectStylus 2 a try with your K1. I had also been wanting the K1 when it was first announced. I'll revisit gaming on android when the K2 is released. Funny thing, Humble Bundle keeps trying to build up my Android app collection even though my original N7 is barely holding on. ARGH!! I keep forgetting I need to ask this question. 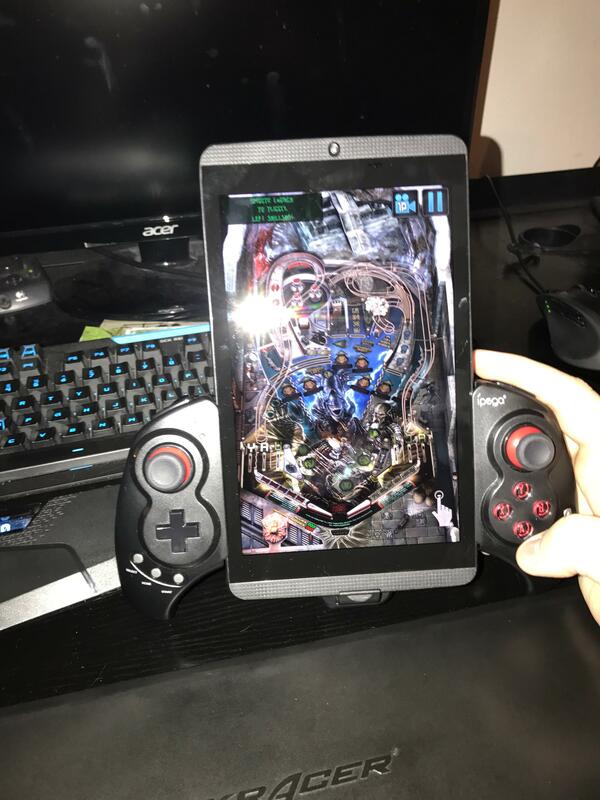 How well does the K1 and your controller setup handle pinball apps? 1, K2 (X1) shield tablet was cancelled when nvidia and nintendo climbed under the blankies together and produced the Switch console (X1 shield tablet with different paint scheme). I am watching CES 2017 (going on now) closely because nvidia has a huge section set up for itself there. Fans are praying for a new shield tablet announcement but the media over all is pointing at a updated shield tablet tv and new shield controller.